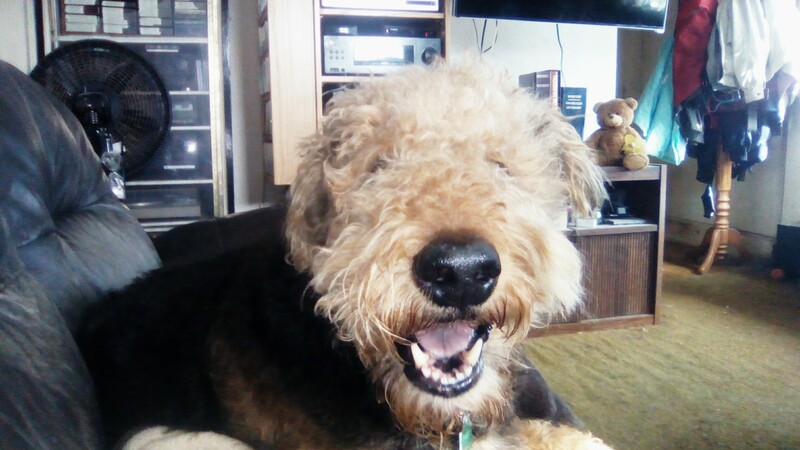 We lost our beautiful Airedale, Bailey two years ago. Bailey was a big dog. He was an Oorang, the kind of Airedale that some breeders say are ruining the breed because of their size. Bailey weighed 100 pounds and was 26 inches at his shoulders. He had the aloofness, the independence, and the stubbornness that Airedales are known for. He also had the goofy, clownish personality that endears every Airedale to their caretaker. Yet, there were many dark sides to living with Bailey. He had to be walked twice a day because he wouldn’t poop in our yard, even though we picked it up wherever he pooped. We walked him when it was below zero and hot enough to make the pavement steam, through wind, snow, and rain. The times either Ed or I fell in the snow or on the ice during winter walks and had a heck of a time getting up while hanging on to him since he was ready to continue the walk. The time he pulled the leash out of my hand and ran after the UPS truck. The barking that scared most everybody until they got to know him. The time he tried to eat the temperature knob on our cooktop. The carpets that he tried to dig a hole in. On top of it all, Bailey had epilepsy. His seizures were terrifying. The light in his eyes when he finally figured out a command and got it right. How happy he was to see a friend. How sweet he was at making himself small in order to make a new friend of a puppy or small dog. How he was never food or toy protective except for when he had a butcher bone. The way he savored the occasional butcher bone he had. How he put up with being teased and learned quickly just how to tease us back. How gentle he would be when putting a paw on our knee for attention. How we loved watching him run with us. How he loved puddling along the lake shallows or the Mississippi backwaters. On April 10, 2016, Bailey had a stroke. He walked up to me, his jaw slack and drooling. I couldn't help him. He walked to the door. He laid down and then he was gone. That was the darkest side of loving a dog.